Mounting: Usually, it is a quicker choice as it comes as the metal framework with the head, channels, and shank. People use their own choice of stones in these semi mounted rings. Shank: The shank is the circular part of a ring which goes onto the finger. This could be built from any metal. If you want it to be made in a specific metal, then you can ask your jeweler to do that. Head: The upper part of the mounting that practically holds the central stone is known as the head. The head could be in prongs or bezel shaped depending on the weight and size of the center stone. You can choose the same metal for the head as the shank or you can try on a different metal. 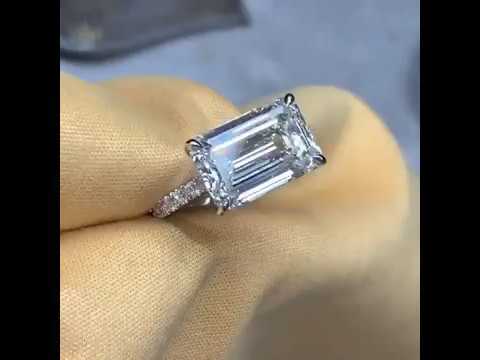 Prongs: The prongs actually support the stones, but six-pronged custom engagement rings Toronto may not be showing off your diamond properly, but a four-pronged engagement ring will definitely do. Bezel: In the bezel styled custom made engagement rings, the central stone is pushed by a thin layer of metal around the stone. It protects the edges but also reduces the brightness. Channel setting: The channel setting allows the stones to be put together edge to edge without any protective metal over them. It is common in diamond melee. Halo: In this design, the central diamond is covered by many small diamonds which makes it look bigger. Bead: In the bead style of a ring, the stones are put in the drilled holes of a mounted framework of an engagement ring and the mounted head metal support and push and hold the stone at their place. Pave setting: In this design, many small diamonds are put on in a honeycomb pattern in the drilled holes of a mounted engagement ring. How would you customize your engagement ring? PreviousPrevious post:Where to Start When Looking for an Engagement Ring?NextNext post:What is a GIA Certificate?